All views are not created equal. Let’s start by saying when you visit the Peak Lodge, you have a view of five U.S. States, as well as Canada and three mountain ranges. 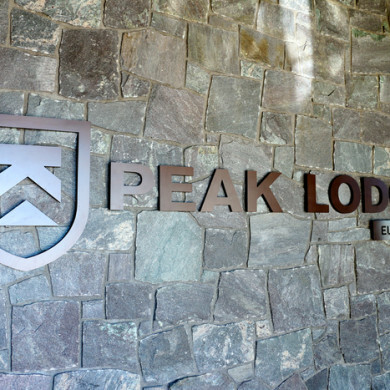 The Peak Lodge is a perfect spot for breakfast, lunch, dinner, or an après-ski drink by the fire. To give you a “peek,” we talked to Michael Joseph, PR Manager for Killington Resort, where the lodge is housed. As for that structure, the original one was also the summit gondola terminal. The new lodge shares the same footprint at 4,241 feet – making it the highest finished structure in all of Vermont. Joseph tells us the entire building down the foundation is new, officially opening its doors just after Christmas on December 27, 2013. Here, the food is all freshly made using local ingredients – and the same rings true for the bar, where local libations flow like a mountain spring. The gondola opens at 9 a.m. on weekends and 10 a.m. on weekdays, so get there early to try a made-to-order omelet or breakfast sandwich. At lunch, we suggest the Mussel Fettucine or Smoked Salmon BLT. Winter have you feeling chilly? Order the Chipotle Apple Turkey or Vegetarian Pumpkin Chili. There is a buffet at lunch, with stations including pasta, deli, burgers and more. At Sunset Dinners in the summer, chef carving stations are open 6 to 8 p.m. with live music and a cash bar. The last ride down the gondola is at 9 p.m. The Peak Lodge features daily specials – the menu and views change with the season – so hop on the K-1 Express Gondola, Vermont’s highest lift, and experience this one-of-a-kind place for yourself. When you’re done dining, there’s much more to see and do at the largest ski and snowboard destination in Eastern North America. In summer and fall, Killington is a world-class destination for outdoor recreation, with more than 35 miles of hiking and mountain biking trails, scenic rides, disc golf and exciting new attractions at Snowshed Adventure Center. Get a true taste of Vermont at Peak Lodge. For more information, visit the Peak Lodge website, or hop on the gondola!